Our porcelain presale is on and a wonderful giveaway! Hello!! 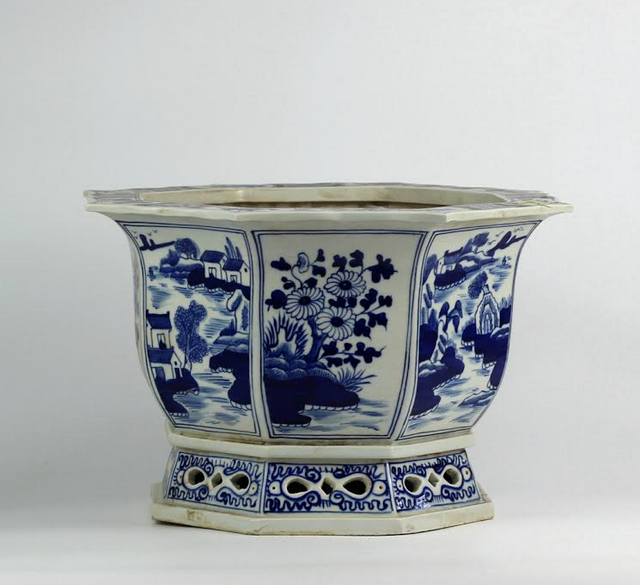 Our next and very exciting porcelain container is en route and will be here in just a few weeks. Posting this later in the day as we get lots of requests for a later posting every now and then for sale from our West Coast readers so this ones for you! This container is coming in fast and furious! Some long awaited best sellers are making a return and a number of exciting new arrivals sure to become new favorites. Best part is that this container will be here within 10 days- 2 weeks. Almost instant gratification:) Most items are 20-35% off what they will be when they get added to the shop site (and even then are still well below retail)! For anyone new to these arrival sales, please read over the rules below before placing your order. As always any questions or clarification you might need feel free to call us anytime 800-804-9565. ITEM 7. Finally! This incredible scalloped planters are my all time favorites. Everything about them, from the scalloped profile, to the pierced base and the handpainted panels is just the height of elegance. Gorgeous for orchids or any holiday flower/plant. Truly spectacular. ITEM 8. Love these darling cups/holders. Perfect for things like pens, makeup brushes, paint brushes,etc….these cuties measure 5.5″ x 6.5″. Specify style, figurine or floral. This is very large and makes a major statement. Measures 27″ x 13.5″, be prepared to be wowed! An all time favorite with good reason, this is the kind of jar that evokes ginger jar envy! This jar would be quadruple these prices in other high end porcelain store, so this is a steal! OK if this doesn’t get you excited don’t know what will…this has my heart racing and my mind alive with all kinds of beautiful possible new vignettes!! I also am having a little love affair with how gorgeous blue and white looks next to fall’s colors and am working on a few fall inspired fall vignettes myself. 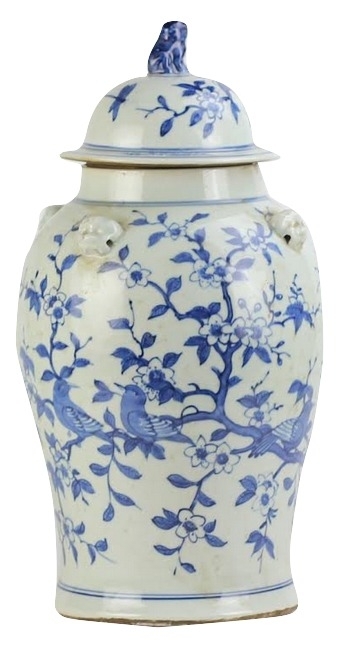 One very lucky blue and white loving Enchanted Home reader will win this fabulous jar, a great start to a new vignette or adding to an existing, this jar is super versatile. Just leave a comment on this post telling us your favorite item on this post and I will announce a winner on Sunday! Thanks for stopping by, wishing you a wonderful day and great afternoon. Until next time……. 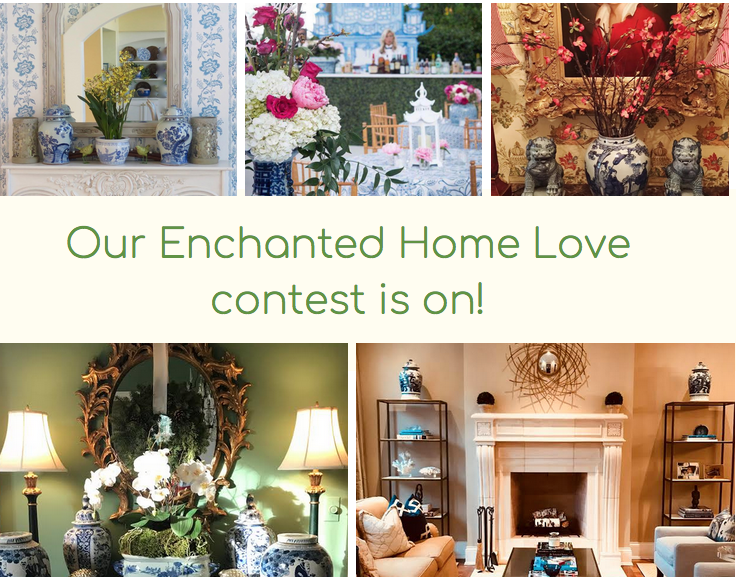 PS Don’t forget to send in your picture(s) to enter the Enchanted Home Love contest, click here for details. Gotten in some beauties so far! Max 2 pictures per person please send to info@enchantedhome.com. It is so hard to choose one favorite. I love the collection with the cherry blossoms, be it vase or fishbowl. Cherry blossom season here in DC bring so many wonderful memories in the cherry blossoms with my children, now grown….Love all my blue and white but those carry a lovely sentimental value as well! My favorite piece is #16 the mid-sized fishbowl. Perfect for a fall mum on my porch!! I love, love the Classic Dragon Garden Sest! I bought a different one from TEH last year and it remains my all time favorite! The new Dragon one would be such a great companion! #2 the fishbowl! This is a classic that every home should have! Hi, love the dragon garden seat! All of it is just beautiful if you love blue and white! Number 13 is the lucky one as a favorite. Number 1 is a close second. All are beautiful–as always. With blue and white, you cannot go wrong. Just love the garden seat…well actually anything blue will do….. I meet your perquisite! I’m happy to say! Item 18, is a beautiful jar! What a statement piece! 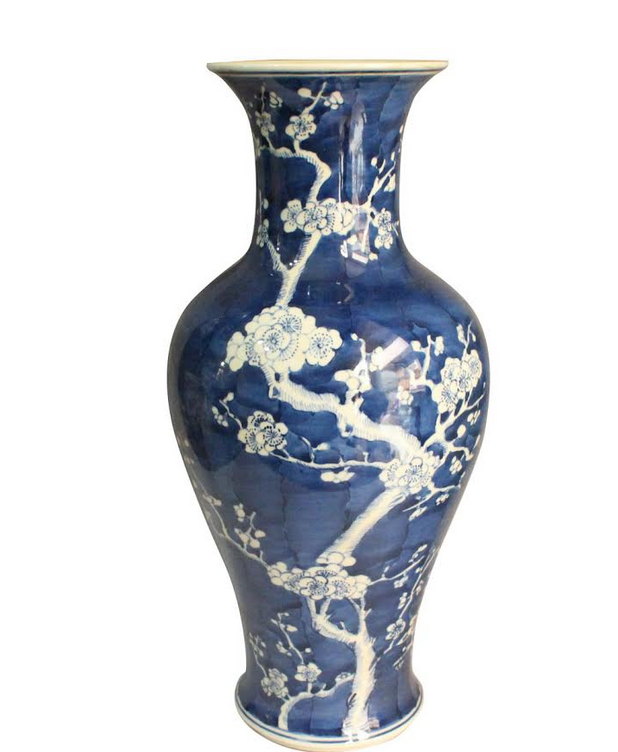 Item #17 : the navy cherry blossom vase is absolutely lovely! Oh I am over the ginger jar for these pieces! The cherry blossom designs are calling me. Especially the item 14 mid sized fish bowl! Thanks for the post. I am looking forward to seeing your autumn vignettes. The large bowl is on my wish list! Just beautiful! Of course it is all beautiful. Number 14 with one of your topiary balls would be perfect. It’s as difficult as choosing a favorite child! Number #13 makes my heart flutter. Item #15 is so fabulous! Would love this in my house or screened in porch. Love all things blue and white 💙😍 footbath is my favorite ! My favorite is definitely #16. Just exquisite! Love the garden seat! A must have for me. I have to say no. 18 the large ginger jar is absolutely fabulous! I love the jumbo fishbowls. Would love them for my front porch. I love them all, my favorite would be the cherry blossom vase in Navy. Such an elegant, classic shape and the depth of the blue is serene and rich. 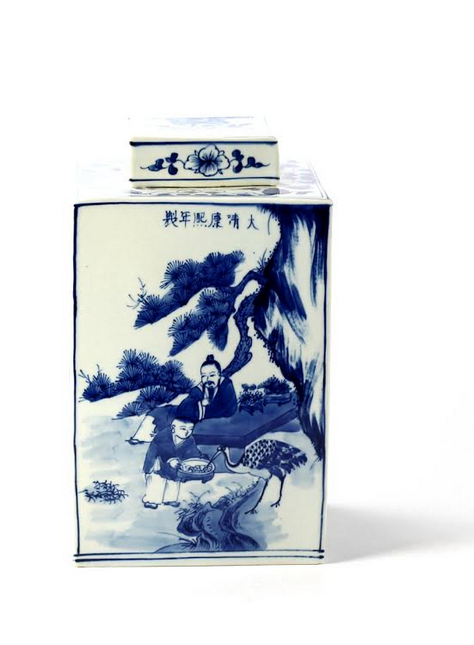 It’s hard not to love blue and white porcelains-anywhere and everywhere! Always a big fan of the garden seats! Ooh so many to pick from! I do love item #18 the new Ginger Jar. Really hard to narrow down what to purchase! Love the giveway jar too! My favorites are # 3 and the dragon garden seat. 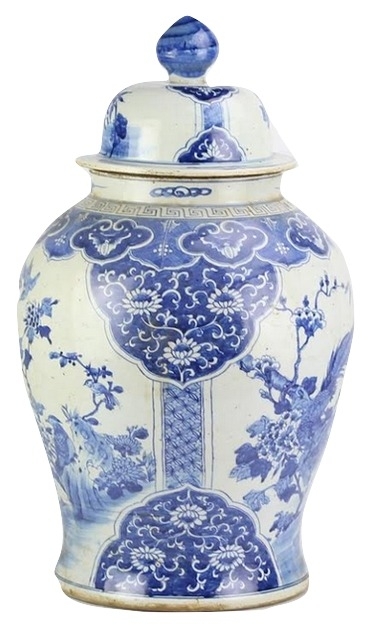 Your decors are so inspirational, I’ve slowly started adding blue and white in my home. Love your blue & white and especially # 13! I love #15 and everything else as well! Love the square tea jar, #4. Love item # 13! 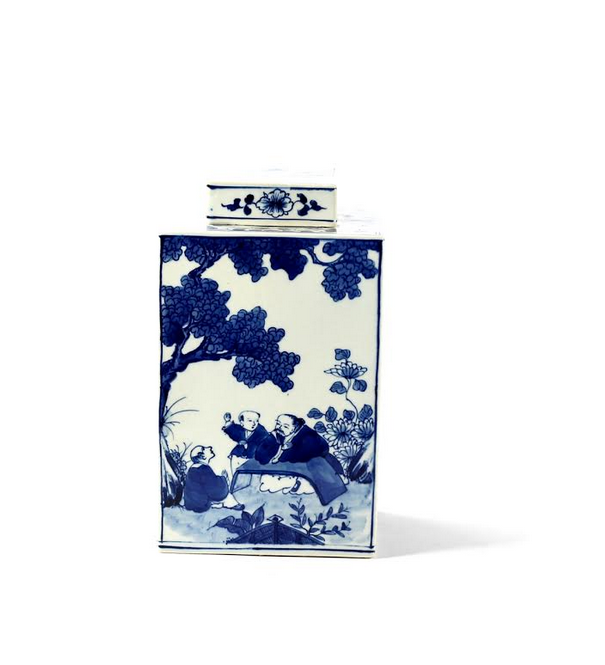 The beautiful hand-painted scene and the shape of the jar are exquisite! 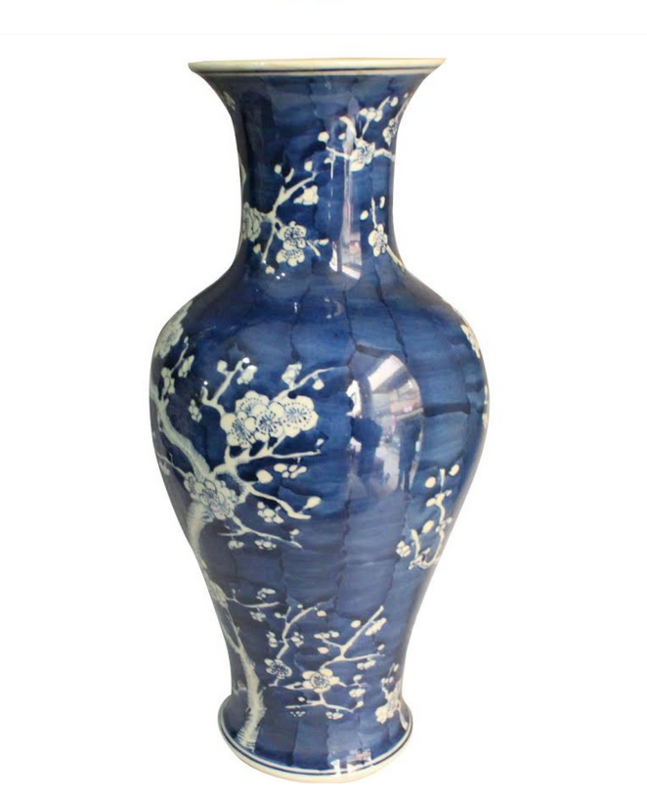 The navy cherry blossom vase has caught my eye – stunning! 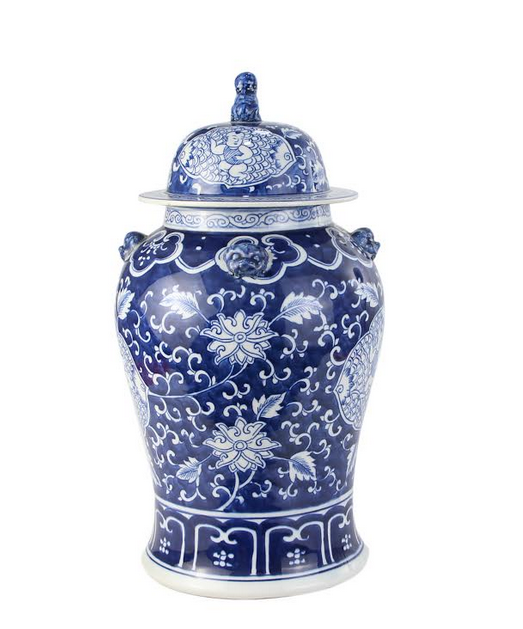 Loving the new #1 ginger jar, I have a room with royal blues and this will fit perfectly into the vignette. Beautiful arrivals coming! I agree…#18 ginger jar is truly exquisite. However, I am torn between #18 and the cherry blossom fishbowl. I already have two, thinking about getting a third and can’t begin to tell you how much I admire them (and not my dying plants). Green thumb, I don’t have…but will never give up trying! 🙂 The fishbowls are magnificent and I highly recommend! Love all the blue and white. Really love number 18. How can you not love this gorgeous collection! LOVE the cherry blossom fishbowl! I really love #17 and #14. Actually, I love everything in that collection! Its one of the best ways a desert dweller can enjoy cherry blossoms without having to travel. Happy Fall! My whole house is blue & white! Saw several new items I love. 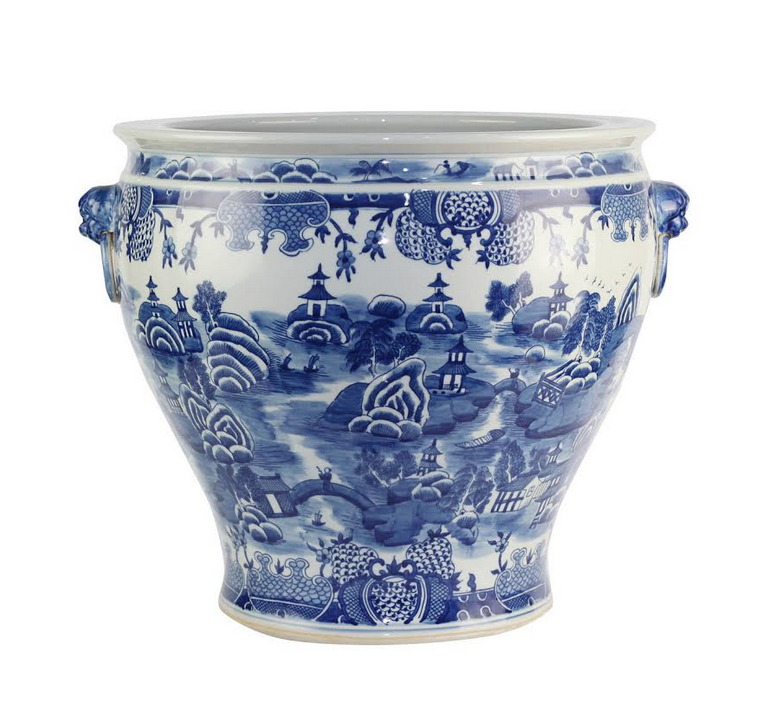 Will you be getting any more of the porcelain ice buckets with the rattan handle? I love them all but if I have to pick, it would be #14, the blue fishbowl with off white Design. I love item 5. It is perfect for a plant I own. My favorite item is the garden seat. Perfect indoors or out. 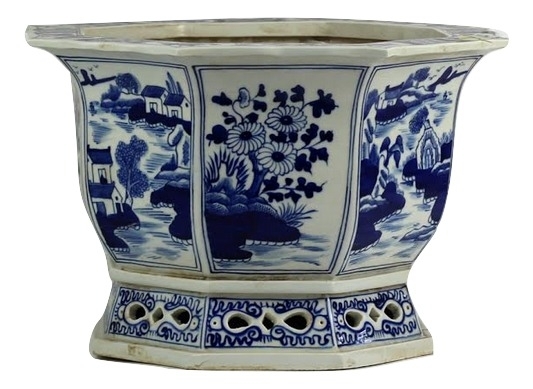 My favorite porcelain is the extra large oversized village scene fishbowl. i have it planted with orchids. Love it! Oh my…# 11…totally awesome. Hard to choose. My favorite is the dragon garden seat. #18 is just beautiful blue and white goodness! BTW: I FINALLY clicked to buy my first ever blue and white pieces from you. I received a starter set from you just a few days ago. I love it all! Thank you from the West Coast…I appreciate your thoughtfulness….I like them all…I am torn between #1 and #18…I don’t think I have a place to put #18 but have been going from room to room taking measurements….It is a WOW figure….I’m going to be ordering #10 as a pair…and am still waiting till you get in the smaller ginger jars.. I love #9 and #11, could not go wrong with either! I love item #2… such a great piece!!! The planter and cherry blossom vase are on my Xmas list! Love the fish bowls, just beautiful! Love the cherry blossom, mid-sized fish bowl! Exquisite. I love number 7. I think it will look just beautiful on my round kitchen table with mums in It for the fall season. be multifunctional and could be used in any room. This is a gorgeous new shipment coming in! !💙 So in love with #17, the cherry blossom vase. and #14, the cherry blossom fish bowl. I’m thinking they would look so pretty in my sun room, especially with a boxwood in the bowl!! Love #17. Would look beautiful with cherry blossoms! As usual I could never choose just one favorite. Top two are the square tea jars and the last ginger jar #18. But everything is gorgeous gorgeous gorgeous. The dragon garden seat is at the top of my list! I love everything on this post, but the #18 Ginger Jar is beyond fabulous!!! While they are all gorgeous, my all time favorite is #2 the fishbowl! I have had one in my foyer for many years with a fern in it. Without a doubt #18 !! Beautiful and what a statement it makes! I love numbers 12, 14 and 17! Beautiful blues!!! 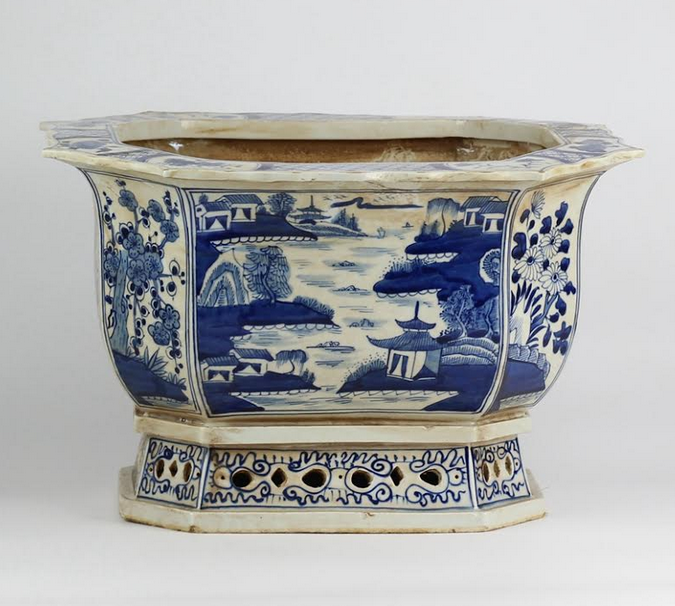 Item 7B, The octagonal scalloped planter. I ordered this from you last December and it is my favorite! Can not beat the price on this item from your site! 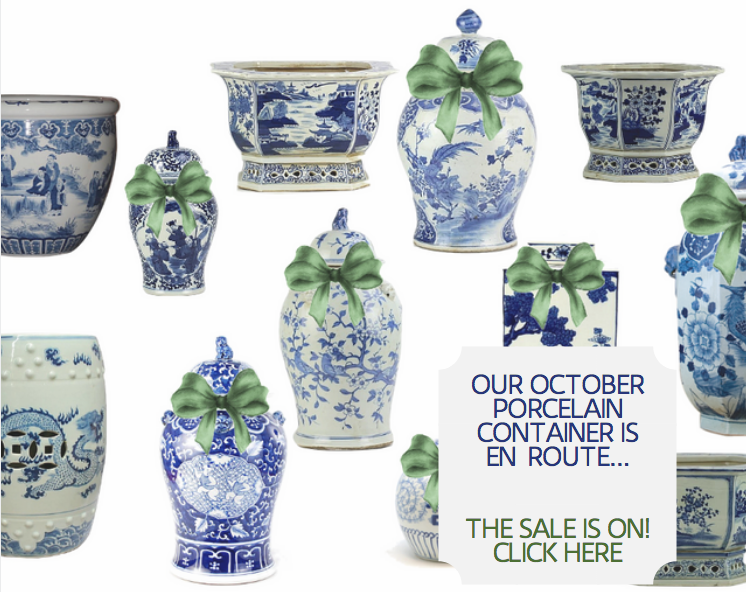 Thrilled that my favorite ginger jar (#18) is coming in this container! Hope to get it. Tina as always I love them all! I like the large bowl the best. I have several pieces and the bowl would be a nice addition. Classic garden seat and the vases are my faves!! Item #13 is stunning. LOVE! All beautiful! I think 7B is one of my top favs. I can just beautiful orchids I’m it on my coffee table. LOVE your give away as well! Thank you for sharing such amazing posts with us! So hard to select one favorite, however, I will have to go with Item 18, the ginger jar. I love the give away jar. Sooo pretty as is everything. Item 2 is my favorite, so versatile! I have one already. May need another! It’s very hard for me to choose between #11 and 18. Lovely items! My favorite item is #18. I’d love a couple of them for my living room mantle! 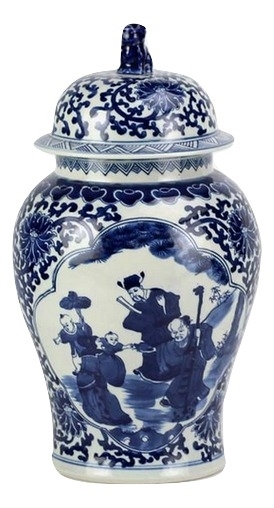 The giveaway double happiness jar is my favorite- it makes me happy just looking at it! No. 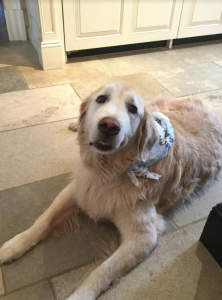 18 is beyond magnificent! Definitely a statement piece to be remembered. My favorite is #6, the centerpiece bowl. Gorgeous!! Love #6. Totally a must have classic. I LOVE them all, but if forced to choose just one, I choose #18. Everything is amazing! I am crazy about 6&11. I have #6 and it is gorgeous! What I like about number 11 is that it has a soft brush stroke look and is a lighter shade of blue. What beautiful pieces! I especially love Item No. 13. I love the tall jar. It is so lovely. This time I love number 4. This shipment has all my favorites and I enjoy the ones I have in my home. 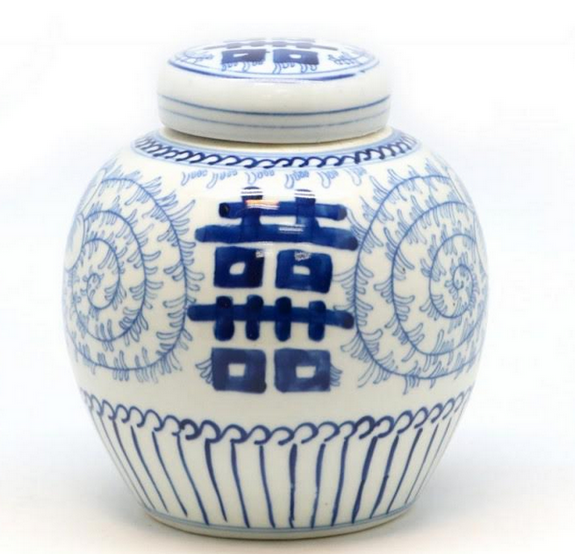 “Ginger jar envy” describes perfectly how I am feeling looking at these many awesome pieces. Love 💙 the garden bench! The square tea jar is my first pick from this container & the cute cups/holders! I will need to do some shopping. Item 11 is my favorite. Good Day, I love item 11. The attention to detail is exquisite and I know just where I would place them in my home. Thanks for sharing such beautiful and reasonably priced items. My favorite is actually the give away! Item #2 is my favorite…the orchids are just waiting for their new home. A very close second favorite is #12 because who doesn’t love double happiness? I love #6 after seeing it on your island in Palmetto Bluff. The giveaway jar is also a favorite. Was love to win it! 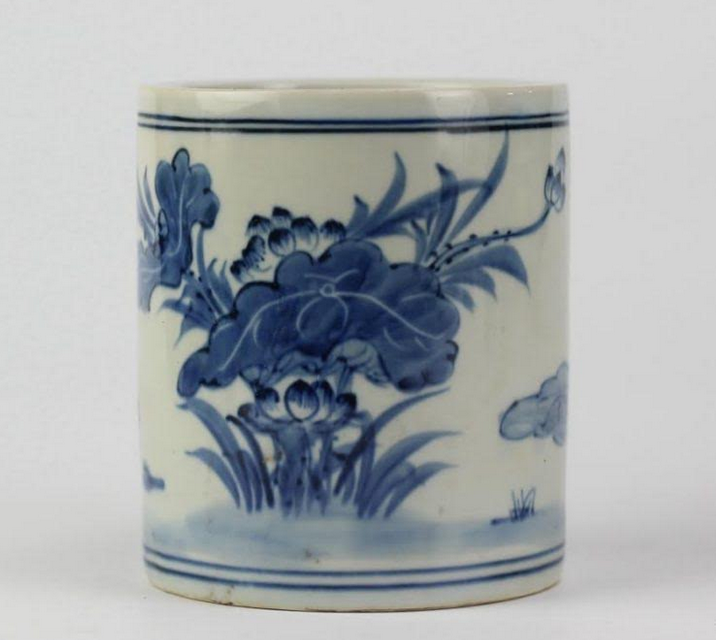 Of course, all of these blue and white items are beautiful but items #4 and #18 really stand out for me! 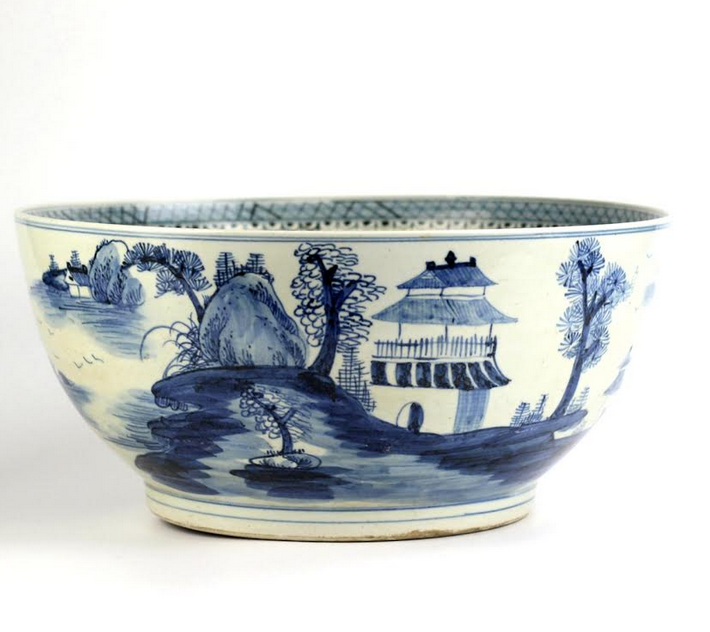 Love your best selling bowl, a little large for my table will you ever do it smaller like 14″. Your posts are just wonderful!! Item #8 would make perfect party favors at each place setting filled with a single hydrangea. 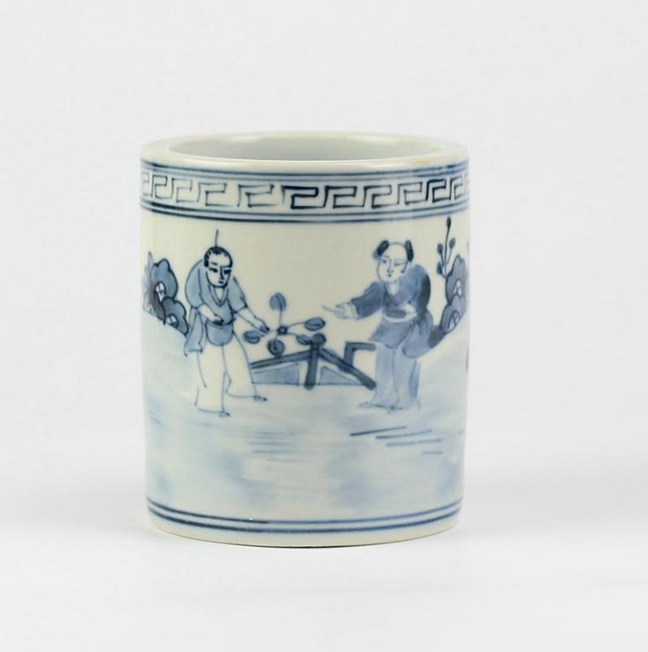 The cups/holders are lovely in both designs. I know each guest would be thrilled to receive one for taking home. Naturally, I would have to get a few extra for keeping for myself. Your faux hydrangeas which I have in my dining room would be perfect in them with the stem shortened , of course. Needless to say, I could not part with your faux hydrangeas which I already own. Therefore, I would need to purchase more for the party favors. All of your blue and white are stand-outs. Hard to pick one favorite of all these beautiful porcelains. I love so many of them. 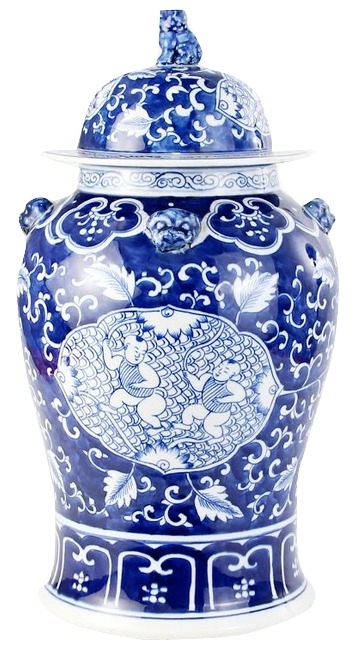 Item #3 is gorgeous and I hope to own one soon, as it will work with the blue and white ginger jars I already have. Love the songbird design! Also love the giveaway. Your website and posts are the best. I love #1 and #15. You always have the prettiest pieces. I’m crazy about number 13!! 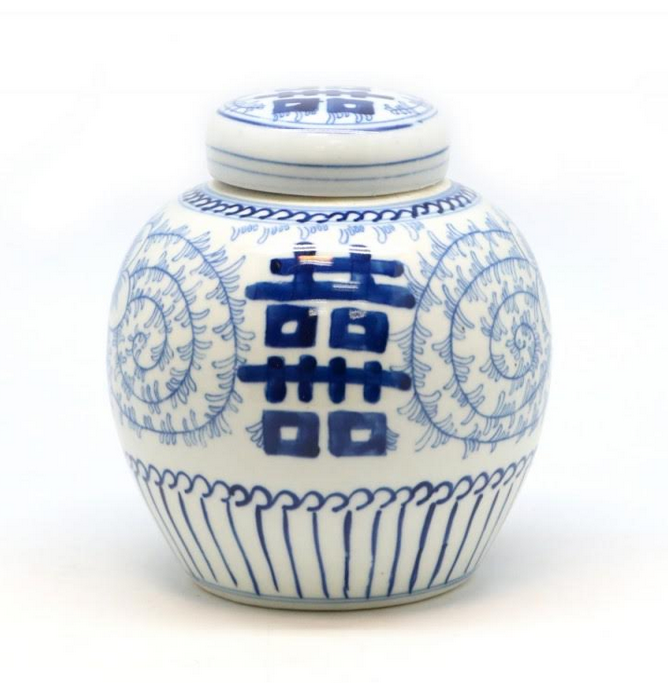 The ginger jars are all so special that it is hard to chose just one. All beautiful! 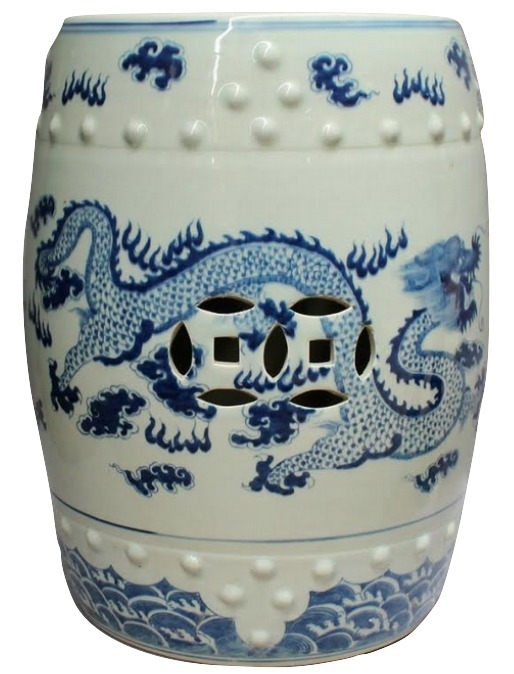 Love dragon garden seat and #11 – the ginger jar you would take on remote island. Ordering TODAY! Can’t wait for ornaments and wrapping to be available too. I live item 18. You really did end with a bang ! That is a real show stopper ! I love it ! All the items are perfect, but I like #10 the best. Thanks. The last one, #18, is beautiful. Will see if I can find a good place in my new home for this one. Love how different #18 is! Entering! My wedding is the end of October and is all blue and white prints & jars, with pink flowers. 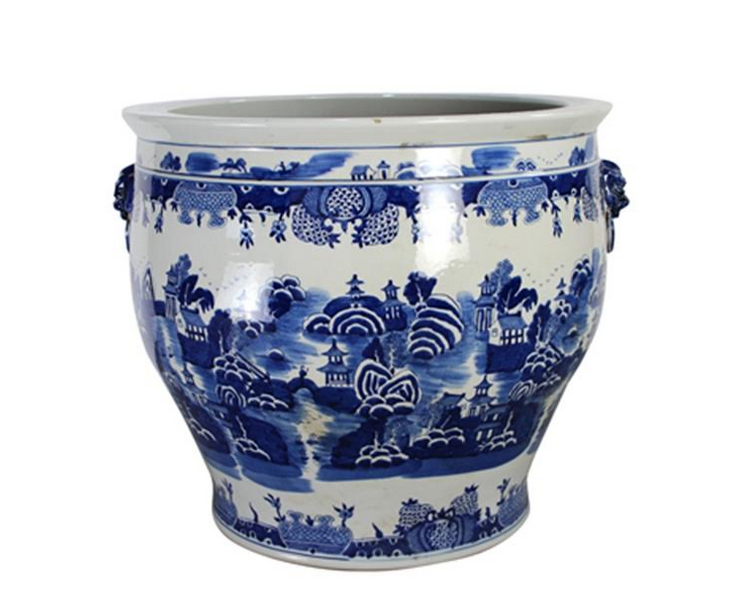 Favorite item today= Item 16- the mid sized fishbowl is BEAUTIFUL, intricate work and design. Thank you! I love number 11! 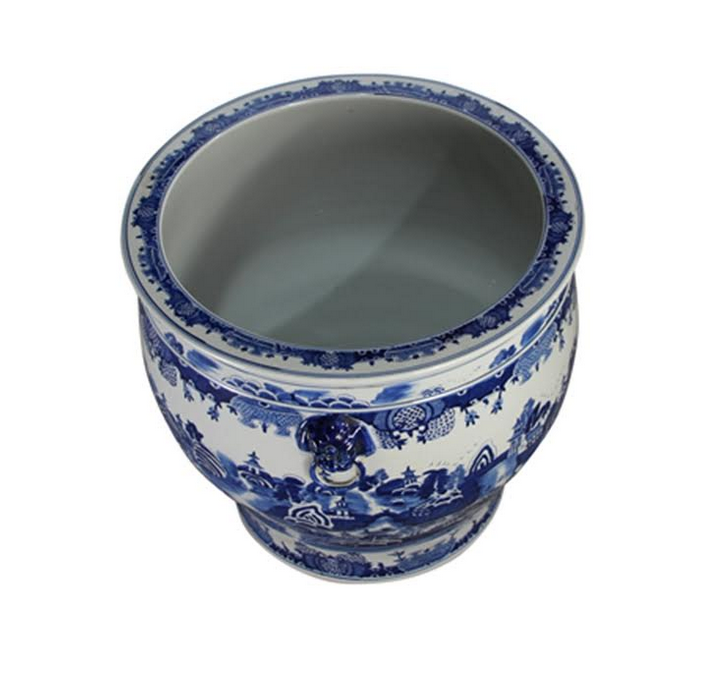 All of your blue and white porcelains are beautiful! 💙💙💙 Items #8 & #12!!! I have a lot of large B&W porcelain but these small pieces are precious!!! Oh my!!!! I love them all, but #15 is my favorite. 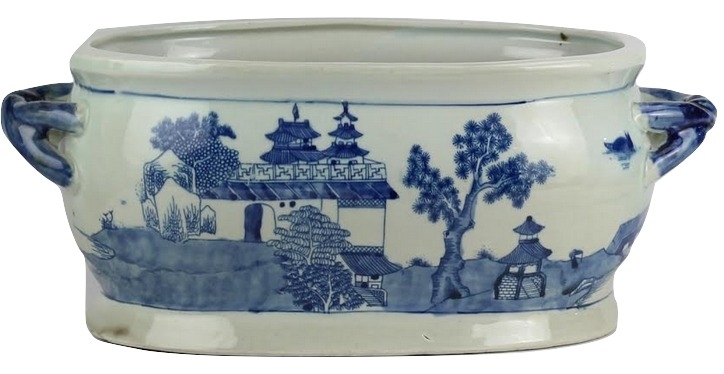 I love every piece of porcelain, especially the ones with village scenes! My favorite photo however, hands down, is that beautiful pup!!! Favorite item is number 18! Can’t think of anything better to “go big or go home” for than a 27” Ginger jar! Absolutely LOVE!! I love item #18! Just bought my first jar from here a few weeks ago and can’t wait to stock up my collection with more! I love item 10 so much bc I could see them on my kitchen counter!!! 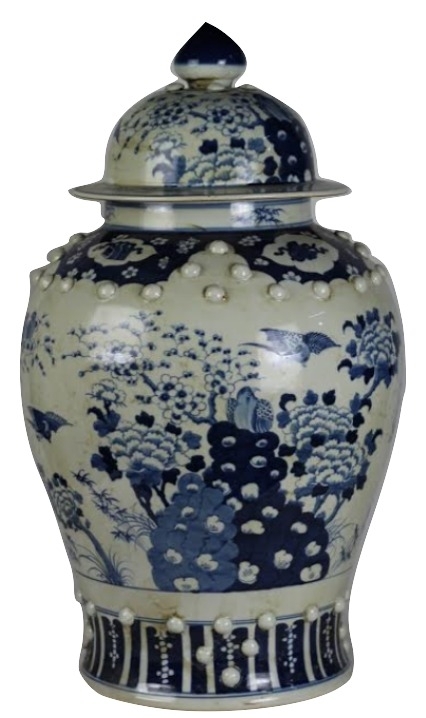 I love Item #17, the navy and white cherry blossom vase. Any flower color would look beautiful in it. # 2 is a favorite of mine. It would be lovely on my dining room table filled with fall mums and foliage or it is the perfect height to fit on top of my armoir. Thank you for the beautiful selections. First, to Shawna B., your suggestion to Tina is a great idea! The fish bowl #2 is my lust. I also like #6 bowl which I envision in the center of a new dining room table! Thank you Tina for hosting a chance to own yet another piece. I am loving #11 for a vignette in my dining room. If all the gorgeous things I keep going back to those exquisite little cup/holders. I paint so I can definitely see those holding paint brushes and just about anything else small in my whole house. Your posts bring a lot of joy to my day. Love happiness jars. Probably one of my favorites. I use them all over my house. Always room for one more. I love all the ginger jars! Love every single item, but (item #3) is beyond gorgeous! Item 11-the pair of stunning ginger jars. I have a soft spot for ginger jars and these are spectacular!!! All the pieces are lovely but I really like the planters (7A and 7B). Swooning over all of the blue and white. It’s sooo hard to choose one favorite but … I adore anything with a bird motif and I’m ordering jar #11 for that reason so #11 is my fave!! Just cut fresh bittersweet from my back yard in Maine. 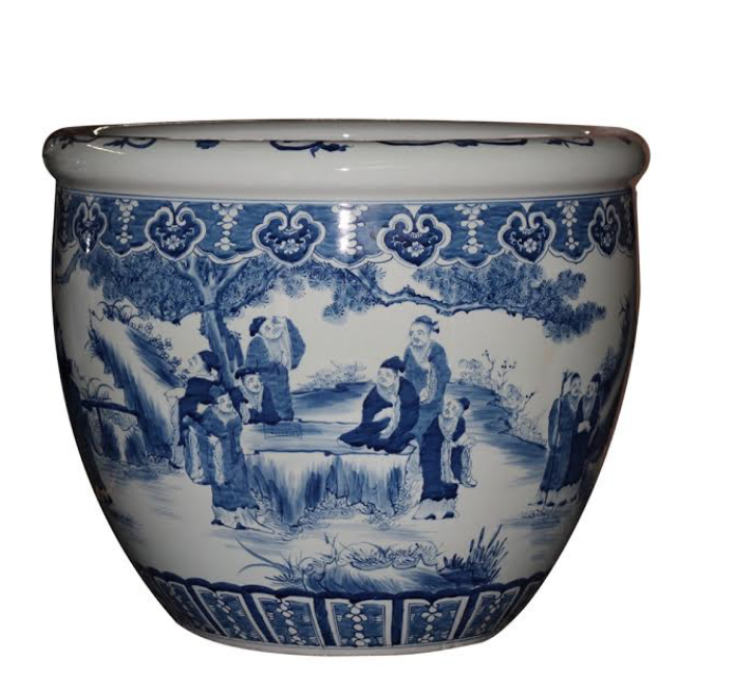 It would look incredible in the navy cherry blossom vase! I really like the little “buttons or bubbles” on the last large jar! What a interesting detail! My favorite? 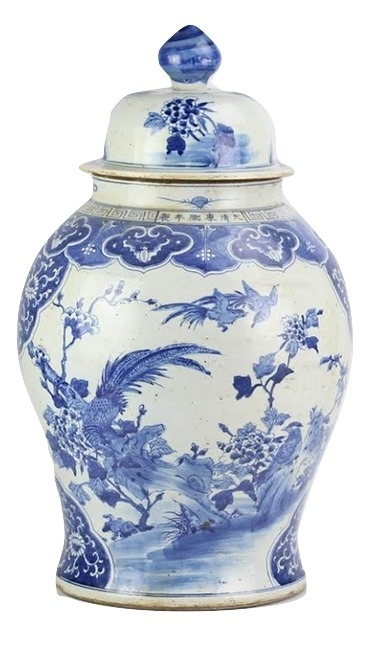 Has to be #17, the navy cherry blossom vase. Just stunning! And it will Never go out of style. I always prefer time-honored classic motifs like this one. I love the garden seat! front door. EVERYBODY comments about the blue and white. My favorites are the fabulous fishbowl…square tea box & I just love the little cup/holder too!! Item 7-all of them- are my favorites!! Everything is lovely! 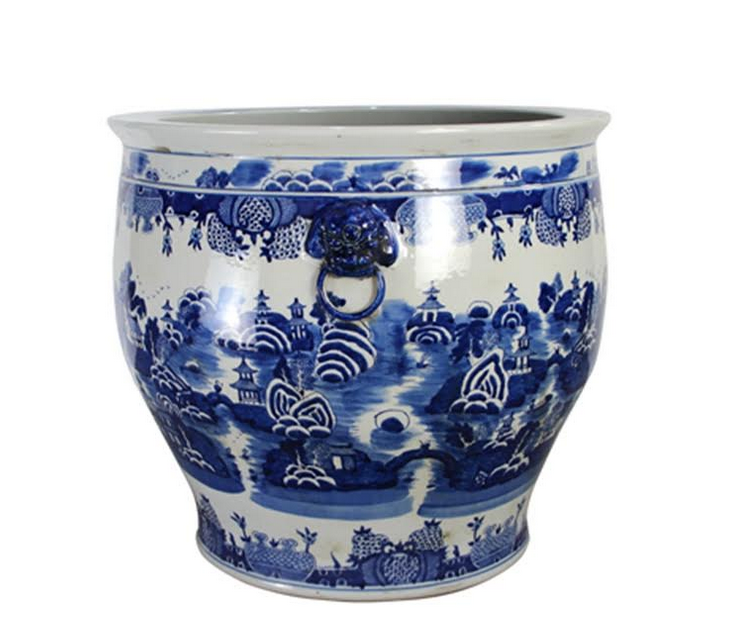 My favorite is item 9 – the classical dragon garden seat. Thank you for always having generous giveaways! Everything is absolutely beautiful, but I especially love item 3. That songbird ginger jar is absolutely beautiful. I love the softer shade of blue that graces it! They are all beautiful ! But #18 I probably my favorite! 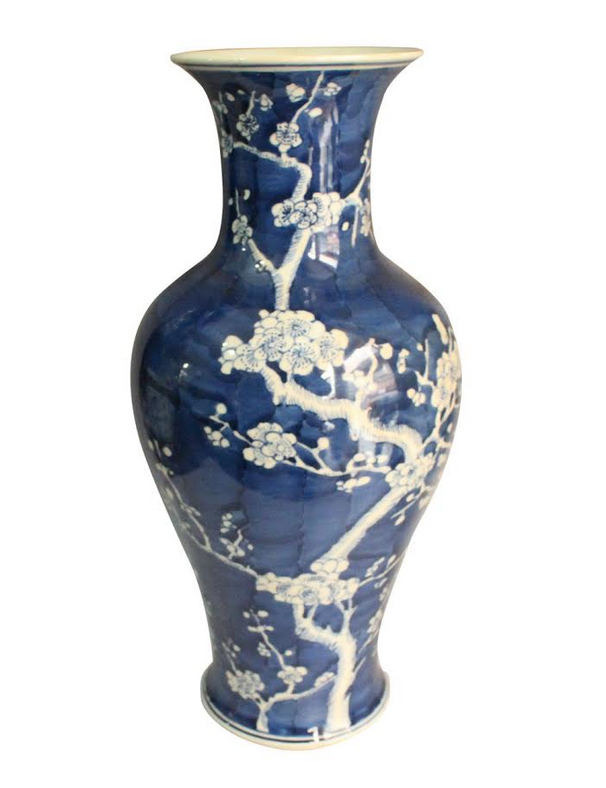 The navy cherry blossom vase is gorgeous. I love everything about it. I can’t pick just one! I love, love, love 2, 7B, 13 and 18! Thanks for showing us all these goodies! 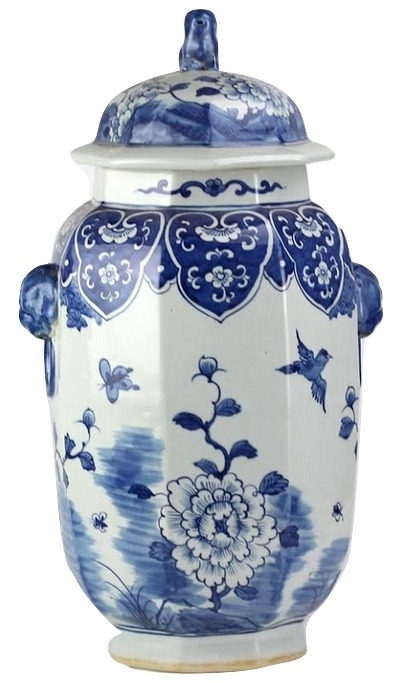 Love the navy cherry blossom vase! Item no.2 is my all time favorite. It does need to come to this Mama! Love ALL of them! If I have to choose one, Item 11 is the winner. Looking forward to deciding which ones will adorn my new home! Everything is a favorite of mine. Today I am ordering the long awaited village scene bowl!!! I can’t wait to get it filled with my shell collection for our river house. It will be front and center on my kitchen island!! Oh happy day!! I love it all! I have a wonderful eye! Love love love#18. House full of blue and white! Do I need more? Yes! It’s all beautiful but that #6 village scene fishbowl is spectacular!!! My new favorite is #4….I have so many pieces, how did I miss a square tea jar?!? I have to have it!!! Love them all but Item #18 is “Big or go home” big bold and top player in the field of B&W. It’s easy to get the smaller items but nearly every collections needs a focal piece. This Lady fills that nicely. I love #18! The dark background is perfect when mixed with other items containing the white background. A great addition to my collection. Item 16 is beautiful but I need two (2) item 10’s. I want them all but I’m in love with the last one—! I think I’m going to have to end up with at least one. Tina , love it all but item #18 is my favorite. Just gorgeous! My favorite is the 7B Octagonal and rectangle with the scallops- so,lovely! Love all the ginger jars. Love those new fishbowls, both the jumbo and mid sizes! Your garden seats are lovely! I love the dragon option in this presale. 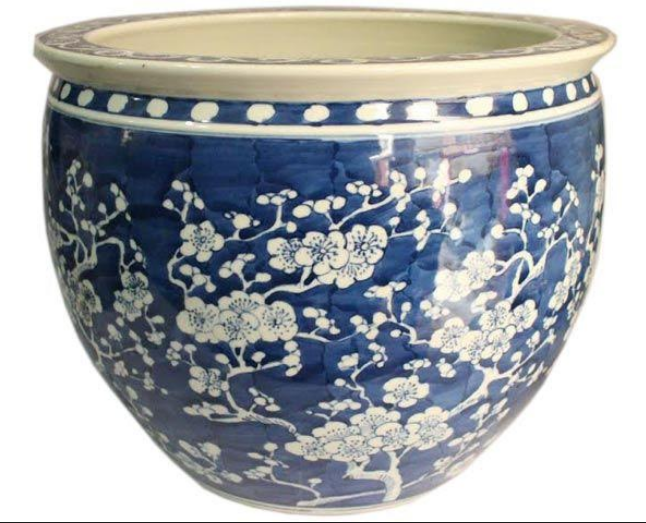 Everything is beautiful but I love the stunning cherry blossom mid sized fishbowl, it is a “must”. Thank you for your interesting blog. No.18 is elegant….but choosing is like deciding on which child to take to Disneyland – seriously difficult choices! So many beautiful pieces but the square tea jar caught my eye. It’s different than other pieces I have. I love all of them! I can’t puck just one! I LOVE #18! No plans for a desserted island but I might choose this one too. It’s all so beautiful. My favorite item on this post is # 13. I would love t see two of them flanking my fireplace or one on each end of a sideboard. I love the shape with the hexagonal or octagonal panels. Just lovely.